When European President Jean-Claude Juncker visited the White House a month ago to discuss the steel and aluminium tariffs, US President Donald Trump jokingly said at the end of their meeting that “your tax lady, she really hates the US companies very much,” referring to the feared EU’s ‘Antitrust Czar’, Danish Commissioner Ms Margrete Vestager who has been accused of only targeting Silicon Valley companies. In the past, Ms Vestager has levied fines on Google, Facebook and Apple. Last week, she started an investigation against Amazon, another company Trump is not a fan of. The Danish politician who is rumoured to be on the shortlist for next EU President when Mr Juncker retires in May of 2019, could be the White House best bet for info on how to investigate Google, Facebook and other social media companies they are planning to levy fines from though. 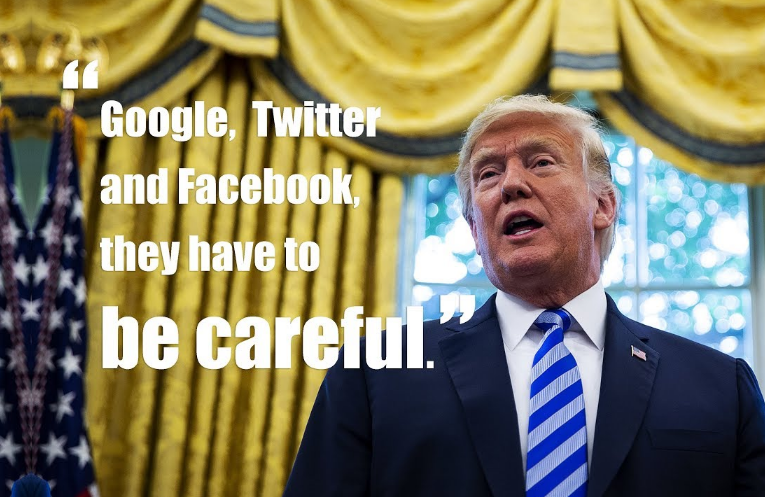 Yes, rumour has it that as of this weekend, POTUS has an executive order prepared on his desk that could trigger an antitrust investigation into Google, Facebook and all other tech giants whom he has accused of anti-conservative bias on their platforms. Mr Trump’s understanding of the legal definition of ‘competition’ is in this manner not only directed at the power the Silicon Valley giants hold in terms of having a monopoly in their respective fields of search (for Google) and social media (for Twitter and Facebook) but in terms of ‘competition’ in terms of free speech. Even if the social media giants can claim that there is no bias against right-wing or conservative voices on their platforms, they know from the EU processes which led to heave fines in the past that during the period of investigation it is best to show no bias at all. In other words, during the probably 90 day (or longer) period that the antitrust agencies would investigate their platforms, the social media giants will be ordered to level the playing field. Should Mr Trump indeed order an antitrust investigation into bias, any blocking of a conservative celebrity’s account (like the Twitter account of Mr James Woods earlier this week) during the investigation period will be seen as left-leaning.